According to her website, French born Pascale Judet studied philosophy before she turned to art in the seventies. Her unique clock-sculptures have a Dali-esque sensibility that taps into the fanciful musings of the unconscious. There is a playful absurdity to Judet's art that is undeniably Surrealist. 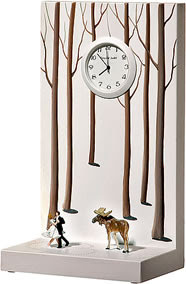 I fell in love with her clock-sculpture Dancing the Moose Away and can't wait to give it to a friend as a housewarming gift. I really like the way that she juxtaposes her tiny figures against painted backdrops, creating miniature environments that just beg to be imaginatively entered into. Uncommon Goods explains that her figures are taken "from model railroad sets" and then placed in the scenes. Judet's work also reminds me of my favorite dollhouse from childhood. The fact that this art object is functional is just icing on the cake. Check out her other timepieces, and maybe Judet's art will inspire you to trade in your digital clock radio for something a lot more fun.